Interactive learning through technology can greatly enhance the outcome of your goals. August Learning Solutions can work with you to create digital content. Our media design department can turn ideas into custom applications, interactive learning tools, medical and device simulations, and nearly any form of 2D or 3D visuals. 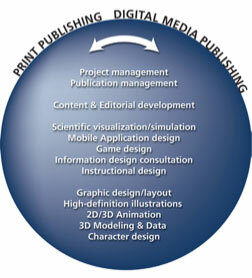 Several of our interactive media staff members are trained as biomedical illustrators and media design specialists. We believe this strength allows them to collaborate better with you—no matter the discipline—to take complex ideas and transform them into dynamic learning experiences. We are experienced in various eBook formats and can deliver validated XML files for complex composition titles. We have completed prototypes for a variety of interactive products that offer scientifically accurate, rich media content. These products were conceived, curated, and produced by our team of instructional and interactive designers, programmers, biomedical illustrators, and animators. We have a patent pending for our interactive mobile learning platform, and we are a certified Apple developer. Our media staff has experience with all aspects of game development, including character and GUI design, game mechanics, Unity programming, and narrative construction. We combine this expertise with our scientific visualization capabilities to forge new learning solutions.